Delicious, fun to make, and looks so pretty on the table. A great intro to spring. Can make the meringues a week ahead. Beat egg whites stiff. Beat in sugar very slowly. Place mixture in zip lock bag and cut a small hole at one of the corners. Squeeze through the zip lock bag opening onto a cookie sheet lined with a Silpat or parchment paper. Combine the strawberries, lemon juice and sugar in a bowl. Let the berries sit at room temperature for 30 minutes. Hold out 24 strawberries pieces for garnish. Put the rest of the strawberries in the food processor and blend until smooth. In a medium bowl with an electric beater with whisk attachment, beat the heavy cream until stiff. Beat in the sugar and vanilla. Crumble half the meringues and fold them into the whipped cream. Reserve around 24 small cookies for decoration. 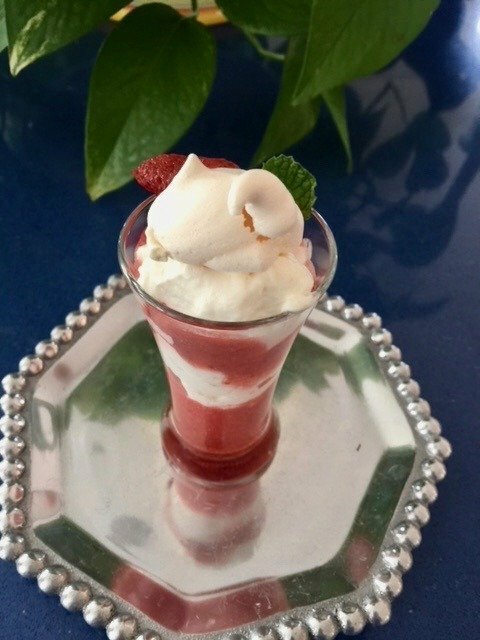 Using 24 shooter glasses, layer the ingredients: Begin with a few spoonfuls of strawberry sauce, followed by dollops of cream mixture. Repeat as space allows. Decorate with a sliced strawberry a sprig of mint and a meringue.